The Phoenix Zoo and the Fauna and Flora Preservation Society of London (now Fauna and Flora International), with financial help from the World Wildlife Fund, are credited with saving the Arabian oryx from extinction. In 1962, these groups started the first captive-breeding herd in any zoo, at the Phoenix Zoo, sometimes referred to as “Operation Oryx”. Starting with 9 animals, the Phoenix Zoo has had over 240 successful births. 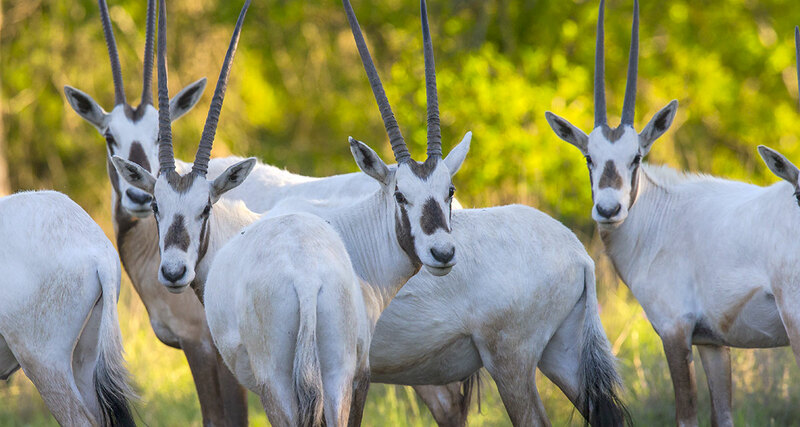 From Phoenix, oryx were sent to other zoos and parks to start new herds. Arabian oryx were hunted to extinction in the wild by 1972. By 1980, the number of Arabian oryx in captivity had increased to the point that reintroduction to the wild was started.The rst release, to Oman, was attempted with oryx from the San Diego Wild Animal Park. Although numbers in Oman have declined, there are now wild populations in Saudi Arabia and Israel, as well. One of the largest populations is found in Mahazat as-Sayd Protected Area, a large, fenced reserve in Saudi Arabia, covering more than 2000 km. On June 28, 2007, Oman’s Arabian Oryx Sanctuary was the rst site ever to be removed from the UNESCO World Heritage List. UNESCO’s reason for this was the Omani government’s decision to open 90% of the site to oil prospecting. The Arabian oryx population on the site has been reduced from 450 in 1996 to only 65 in 2007. Now, fewer than four breeding pairs are left on the site.